The Nebraska Library Commission welcomed Tan Ngo (pronounced Go) in June of 2015 as an accountant. Tan was born in Binh Dinh, Vietnam and immigrated to the United States with her husband sixteen years ago. Even though she had completed three years of teacher education classwork in Vietnam, it wasn’t recognized in the United States so she began again. First she completed a yearlong ESL class and then completed a degree from Southeast Community College in Accounting. She graduated from UNL with a Bachelor’s Degree in Accounting and Finance and just last year, achieved her Master’s Degree from UNL in Professional Accountancy. Tan credits her parents for instilling a value of education in her. In addition, her mother-in-law helped and supported Tan through the years of working, raising a family, attending classes, and completing coursework. Before working for the Library Commission, and while attending school, Tan held many part time jobs including working as: a banquet server at the Cornhusker Hotel, a waitress at Eastmont Towers, a cafeteria worker at Lincoln Public Schools, an assembly line worker at Molex, and as a cashier at Russ’s Market. These experiences helped propel Tan to complete her education. Tan also worked full time for the Nebraska Department of Health and Human Services and the Nebraska Department of Administrative Services (now State Accounting.) When I asked Tan what she thinks about working at the Library Commission, she says it is a very friendly and a supportive place to work. 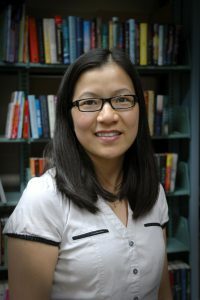 As a young girl growing up in Vietnam, libraries were not free and required both membership and borrower fees which were prohibitive to her family. One way she read books was borrowing them from her friends. As an adult committed to spending time with her children, she reads the same books with her daughter and son. If Tan didn’t have to work, travel would be her priority. First on her list of destinations would be Alaska to see the aurora borealis. As a young girl, Tan considered being a flight attendant most importantly for the travel benefits. The perfect day for Tan would include staying home with family, sleeping, and watching Vietnamese dubbed movies from Hong Kong. Tan’s exercise of choice is running and currently she and her son are completing a 9 week cardio program together. One of the most challenging things Tan has achieved is learning English. Tan and her family speak Vietnamese at home and English at work and at school. At work, one of Tan’s accomplishments has been cheerfully teaching Commission employees to use the online payroll system. We are very proud of Tan and are grateful she has chosen to work at the Library Commission. This entry was posted in General, Public Library Boards of Trustees, Public Relations and tagged Nebraska Library Commission Staff, Nebraska Library Innovation Studios, New Faces, NLC Staff, Staff. Bookmark the permalink.